Sign-up using the form or call us at 760-434-1756 to make your appointment today! Welcome "Walk In Patients!" We are "Back & Neck Pain" Specialists! We put our patient's first, and use the latest in chiropractic technique & research to provide you with caring, professional service with the personal attention you have come to expect from Beach Cities Chiropractic. Located in the heart of Carlsbad Village for over 30 years. We specialize in Family Practice: "Infants to Seniors," Auto Accidents, Sports Injuries, and Personal Injuries. Get the relief you deserve without drugs or surgery. This office is dedicated to serving all patients who want to be healthy, fully functioning and subluxation free, all life long. Hablamos Español. Мы говорим по русски. Mówimy po polsku. "I have worked in a job for 27 years that required very heavy lifting. 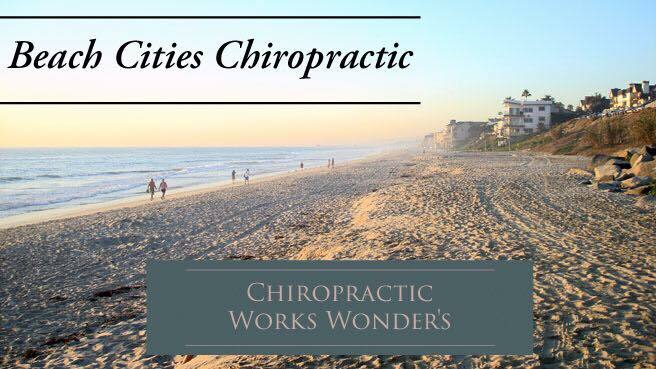 My neck and back have pained me for a long time, but with regular visits Beach Cities Chiropractic has helped me! I am so grateful to both Doc and the entire staff at helping to contribute oi my overall health! Thank you!"